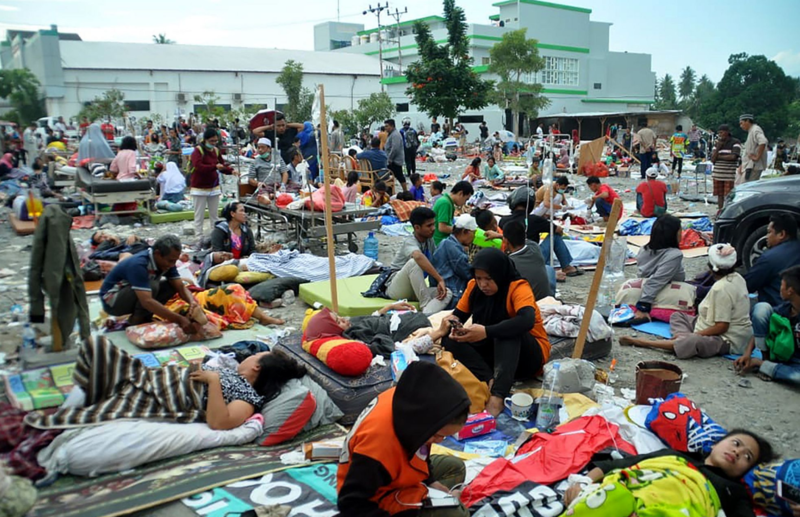 The Indonesian disaster management agency reported that the death toll of the severe earthquake and the subsequent tsunami on the Indonesian island of Sulawesi (Celebes) has risen to 832 fatalities. Meanwhile, the Indonesian Deputy Prime Minister Mr Jusuf KallaIn says he fears thousands of deaths. To add insult to injury, looting is now also taking place on the island. The Indonesian island of Sulawesi was shaken by two subsequent earthquakes on Friday. The first earthquake had a magnitude of 5.9, the second of 7.4. Afterwards a meter-high tsunami wave washed over the west coast of the island. That tsunami caused huge havoc and a high death toll on the island. For the time being, the government certainly counts 832 fatalities and several hundreds of wounded. "And the death toll will probably increase," said Sutopo Nugroho, spokesperson for the Indonesian disaster management agency. According to the spokesman, most of the victims come from the city of Palu, but 11 people also died in Donggala. Earlier there were 420 deaths and over 500 wounded. The tsunami surprised many people who were on a beach where a festival was planned. On images made with a mobile phone, you can see how a big wave arrives on the coast and drags people, boats, cars and entire houses. The high death toll may also be due to the warning system that did not work properly. "There was no siren. Many people were not aware of the danger, "said Sutopo Nugroho. The national meteorological and geophysical center had issued a tsunami warning, but it was abolished a short time afterwards. According to critics, that happened too early. For the time being, most deaths and injuries in the coastal city of Palu, which can only be reached via the air, are counted. This is mainly because the districts of Donggala and Sigi - which had the full layer of the tsunami - were unavailable on Sulawesi until now. Emergency services have now been able to penetrate Donggala for the first time. But even in Palu itself the death toll can still rise because not all buildings have yet been reached. "We have problems to use heavy equipment because the access roads have been destroyed," said Mr Rampangilei, head of the local disaster management agency. It is feared that the number of victims will continue to rise, even in the thousands. The main question, is this the work of Mother Nature, or is this the work of the Cabal? Discernment is becoming very hard to see, as there is so much evil and hate everywhere.